Of all the beer festivals dotting the country this summer, Sierra Nevada’s inaugural Beer Camp Across America has been a doozy. Featuring some of the country's best craft brewers, the seven-city series kicked off on July 19 and has been essentially one big rolling party from the brewery’s first home in Chico, California to the grand opening of its satellite location in Mills River, North Carolina on Sunday. In between events, the caravan stopped at New York's DBGB, where we were lucky enough to meet those involved as they shared stories and plied us with beer. Delicious beer. In our experience, casual beer drinkers rarely get to see the brewing fraternity in action and we were thrilled. One by one, representatives stood up, grabbed the microphone and told amazing stories from the road. These guys have gone skydiving together, raced donkeys and actually brewed beer on a bus (they boiled their water in a microwave). If you’re wondering what to do with your life, listening to this group for 10 minutes will catapult "brewer" to the top of your list. The fact that festival goers have had a chance to meet so many of those living the dream is part of what has made Beer Camp so much fun. Sierra Nevada founder Ken Grossman wrestling with a racing donkey. © Sierra Nevada Brewing Co.
And then there's the beer. The campaign has included a dozen limited-release collaborations that are now being sold in 12-packs around the country (and featured on tap in some beer bars). Sierra partnered with the likes of Bells, Ninkasi, New Glarus, Allagash and other breweries beloved by beer nerds everywhere and the creations run the gamut from a coffee milk stout to a Belgian-style blonde. One of our favorites is the Sierra Nevada/Cigar City Yonder Bock, which harnesses tropical fruit flavors in a surprisingly refreshing way. (The notes come through based the hop selection so even though you can taste them, no papayas were harmed in the making of the beer.) The Sierra/Firestone Torpedo Pilsner is also a winner: hoppy, light and just boozy enough to get the job done on a weekend afternoon. 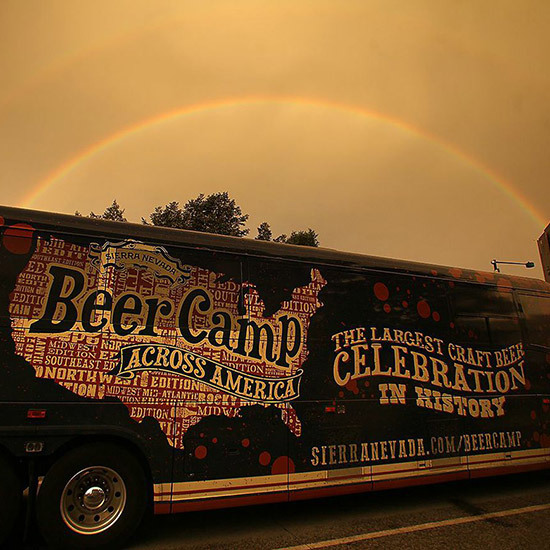 Beer camp has already made stops in San Diego, Denver, Chicago and Portland, Maine, and will stop in Philadelphia tomorrow before the Mill River finale (sold out, but tickets are available through the typical secondary sources). If you are in the area we recommend you hop on a train, a bike, a donkey or whatever you’ve got and rub elbows with the brewing elites as they finish their road trip.